Reminder: the post doc position announced below is open until February 4.
i. Developing comprehensive and innovative methods to improve operating room responsiveness to increasing surgical demand and to better coordinate surgical capacity and demand. 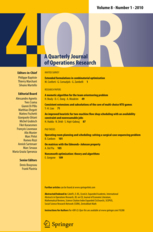 Decision support tools are to be developed combining optimization approaches (based on multi-objective mathematical programming models, heuristics and simulation) to assist resource capacity planning decisions in the operating room, with structured participatory approaches to capture stakeholders’ views and preferences regarding the surgical patient flows and the planning and scheduling of surgeries. The developed methods will be tested and validated in two central hospitals of the Portuguese National Health Service. ii. Support in the management of the ImproveOR: Building Decision Support Tools for Improved Operating Room Management project and in the scientific supervision of masters and doctoral students associated with the different research tasks to be developed in the project. The competition is open for national and foreign candidates who hold a PhD degree in a branch of knowledge or specialty that covers the scientific area of System Engineering and Management or related scientific area. If you have any question about this position, please send me an email (ines.marques.p@tecnico.ulisboa.pt).